(Phys.org)—A pair of researchers with the University of Massachusetts has found that cane toads utilize sensory feedback to coordinate asymmetrical landings mid hop. In their paper published in the journal Biology Letters, Suzanne Cox and Gary Gillis describe a series of experiments they carried out with cane toads and what they found out by doing so. 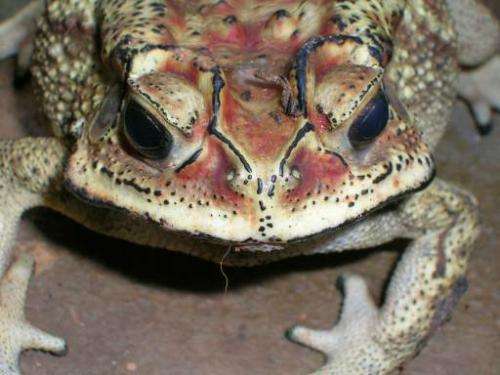 Cane toads have made the news in recent years due to their ability to easily move into new territory and take over—they eat a wide variety of plants and animals making it easy to migrate, and causing them to be considered an invasive species in places like Australia. But, it seems they also have interesting hopping abilities. To learn more about how cane toads manage to have near perfect landings when they hop, the researchers obtained several specimens and brought them into the lab for testing. To get a true sense of how a toad responds while in the air to its circumstances, the researchers applied electromyography sensors to different parts of their bodies—such sensors allow for tracking muscle usage. The researchers set up several scenarios for the toads to see how their bodies responded to different conditions. Under "normal" conditions, they noted that the toads held their front arms and feet out in a typical landing position. But, when the toads were forced to hop off a weighted glass cylinder, the cylinder rolled, which caused the toad to have to twist as a reaction, the researchers found that the toads actually rotated in the air by moving one forelimb forward before the other—an adjustment that led to them being properly aligned as they met the ground. In another experiment, they forced the toads to land on an object with a 45 degree slopped surface and were surprised to note that the toads made no adjustments at all. This, the researchers suggest, likely means the toads are not relying on vision at all when figuring out how to move their bodies in preparation for landing. Instead, it appears they rely exclusively on their vestibular system, which involves an organ in the inner ear that in humans and some other animals, has been shown to be heavily involved in maintaining balance. Coordinated landing requires anticipating the timing and magnitude of impact, which in turn requires sensory input. To better understand how cane toads, well known for coordinated landing, prioritize visual versus vestibular feedback during hopping, we recorded forelimb joint angle patterns and electromyographic data from five animals hopping under two conditions that were designed to force animals to land with one forelimb well before the other. In one condition, landing asymmetry was due to mid-air rolling, created by an unstable takeoff surface. In this condition, visual, vestibular and proprioceptive information could be used to predict asymmetric landing. In the other, animals took off normally, but landed asymmetrically because of a sloped landing surface. In this condition, sensory feedback provided conflicting information, and only visual feedback could appropriately predict the asymmetrical landing. During the roll treatment, when all sensory feedback could be used to predict an asymmetrical landing, pre-landing forelimb muscle activity and movement began earlier in the limb that landed first. However, no such asymmetries in forelimb preparation were apparent during hops onto sloped landings when only visual information could be used to predict landing asymmetry. These data suggest that toads prioritize vestibular or proprioceptive information over visual feedback to coordinate landing.